Wow, that's quite a photo! I really hope he continues healing. Looks like he is going to be a bit of a challenge for farriers in the future to find a healthy angle for his hoof and fetlock. Went wrong, DNF. Appears to be sudden hind leg issue. Race 7 - Laurel Park - Sunday, 7/15/2018. Any news? Didn't look good. Nope not good news for Amigo. Chart says "pulled up lame and euthanized". 6yo Minor Legend was euthanized at Laurel yesterday after being pulled up lame. I have to thank very close friends(ok really family)Suzie Oldham, Jessica and Reagan Stith for going by LSU and seeing Angus! He is doing well and the report is that he loved his peppermints. I really can’t wait for him to come home. The vets X-rayed him again today and all screws and plate are in place and the ankle is fusing so we are happy about that. He has been there 4 months and may become the new LSU mascot if we don’t get him out of there. Thank you for the pictures Suzie and Jess! It appeared that Oscar Performance was pulled up in the Arlington Million. He was in the midst of a batch of horses who were making their move coming into the stretch, but then his rider eased him back. Looked like he may have been pulled up; never saw him cross the line. ETA: The folks on NBCSN showed an interview with Arlington's on-track vet, and she said Ortiz thought Oscar took a bad step, so pulled him up to be safe. The horse was loaded on the horse ambulance for a ride back to the barn, but the vet said he did not show any lameness or signs of injury. Also, Oscar got interfered with by the horse who finished 3rd, and the 4th-place rider lodged an objection against him. Horse was DQ'd from 3rd and placed 4th. Last edited by BaroqueAgain1 on Sun Aug 12, 2018 3:15 pm, edited 1 time in total. ~ Hopefully there's nothing amiss. I was watching the race on NBC because I don't get TVG and I remember being concerned because Oscar was boxed in something awful and I thought "please don't clip heels with anyone big guy" and then he disappeared and never crossed the wire. Also hope Dona Bruja just had a bad day and isn't hurt because I swore she was gonna be pulled up. Exciting News: I talked to Dr. Chuck McCauley yesterday about the plans for Angus. He was X-rayed again yesterday showing that the healing continues and no screws were backing out. Now we have about 3 weeks worth of antibiotics left to give. Once those are finished then he would like to see how he does for 2 weeks after that off the meds. Of course X-rays will be taken every week. IF all is well after these next 5 weeks Dr. McCauley said we would then talk about him being released and coming back home to Indian Ridge Farm! His pain meds have been backed off and he is going for short walks and getting to graze some daily. Wow, what great news! Keeping everything crossed for luck that he continues to do so well and can go home soon! He's adorable! Four months in and he's still doing well, hope he can go home and have a great retirement soon. He'll have a fat ankle but who cares? Just a really neat horse. After a battery of tests performed at Rood & Riddle Equine Hospital found nothing wrong with Oscar Performance (Kitten’s Joy)–who was pulled up in last Saturday’s GI Arlington Million–the horse will soon resume training at Saratoga for trainer Brian Lynch. Owner John Amerman told the TDN Wednesday that his horse will definitely race again. With the latest news, what happened to Oscar Performance in the Million remains somewhat of a mystery. The 9-5 favorite was third early, but started to fade in the stretch and then was pulled up before the wire by jockey Jose Ortiz and vanned off the track. The 4-year-old was sent from Arlington to Rood & Riddle, where Dr. Larry Bramlage and his team were unable to find anything wrong with the colt. Happy to receive this photo from LSU today!! Made me smile and actually made me a bit giddy. So glad to see he's feeling so well without the need for any pain meds! 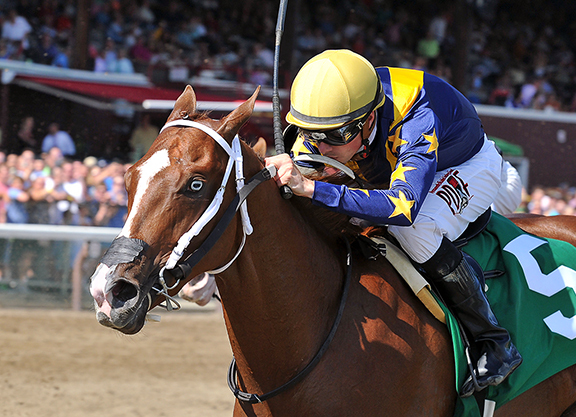 Bowie was pulled up approaching the turn in the 5 1/2-furlong Smart N Fancy Stakes at Saratoga. She did not look steady on her feet in the last glimpse I had of her. Very sad to see I only saw the race because I’d stayed up to see Chanteline run as I’ve followed her for years now. Devastating. Sending hugs to Jamie and and everyone connected to this beautiful girl. Photo from DRF article in July 2016 when she broke her maiden.